James C. Holmes of Blackstone passed away at his home on Tuesday, April 9, 2019. Son of the late Mary Elizabeth and Willie M. Holmes, Sr., he was born on May 29, 1957. James attended school for the deaf in Staunton, VA. Later he was employed with the Town of Blackstone working with the Sanitation Department for twenty years. James loved to walk and ride his bike. He had many friends. 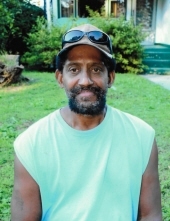 James leaves to cherish his memory: two brothers, Willie M. Holmes, Jr. of Blackstone and Ralph (Angela) Holmes of Joppatown, MD; and a host of nieces, nephews, cousins, devoted neighbors and friends. Funeral Services Saturday, April 13, 2019 at 1:30 p.m. at W.E. Hawkes & Son Funeral Home, Blackstone. Interment Greenview Cemetery, Blackstone. To plant a tree in memory of James C. Holmes, please visit our Tribute Store. "Email Address" would like to share the life celebration of James C. Holmes. Click on the "link" to go to share a favorite memory or leave a condolence message for the family.